Any reaction is the basis of chemistry. It’s important to understand the concept of bases, alkali and acids and how they react with each other to form a chemical. 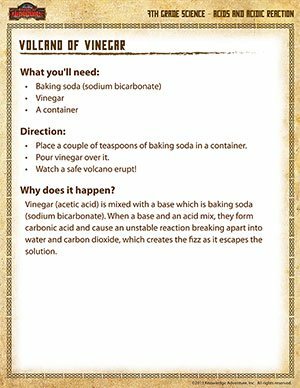 The acid, that is vinegar, is made to react with a base, which is baking soda, to form carbonic acid. 7th graders can try this science experiment alternately with another acidic solution like plenty of lime juice. Don't miss out on other exciting science experiments for kids too!